Homemade Milk Chocolate Cashew Butter. Nut butter is what I make when I feel like making nothing. It doesn’t take much effort to throw some nuts in a large bowl and then watch them spin around some super sharp swirly thing. The closest thing that mirrors effort is trying not to slice your tongue as you lick the blade. Which definitely almost happened to me yesterday. Which was actually after I almost chopped off three of my fingers at three different times. I learned my lesson and quit while I was ahead. Which is exactly how I got to the whole nut butter thing. I’m being serious though. When I feel like making nothing, I always drag out my food processor. It hasn’t failed me before and is the exact way I ended up with containers of dark chocolate toasted almond macaroon butter and chocolate chip cookie dough peanut butter. There is no shortage of things to spread on toast in this house. Or to eat with spoons. One thing I looooathe is when people tell you that OMG this tastes just like “insert food here that can never be replicated without actual food.” !!! But um, this sort of tastes like… something. Maybe frosting? I don’t know. Brownie batter sort of? Not sure again. Either way, it tastes like something really, really good. And I should mention that out of all the nuts, cashews are probably my least favorite. Very weird, I know. But unless they are basically on drugs, like totally spiced up and maybe given a good sugar rub or something, they just don’t do it for me. And since I believe firmly that nuts should be in anything BUT baked goods, I often look for other things to do with them. I mean honestly, I’m convinced that if you like nuts in your cookies and brownies, you are probably 75 years old. And you know, if you are much younger than that and now seriously offended and hate my guts, please don’t. We would make excellent friends. You will probably just love my taste in music. In addition to being the perfect blanket for a spoon, this would make a nice little homemade gift in a cute jar with a cute label, don’t you think? I can’t really be bothered with such things and would rather just bake cookies and throw them on a plate, but some of you crafty people could make the most adorable little surprise out of this. Me… well, I’ll just eat it. Finally, you can always count on me to justify that any nut butter is healthy. It’s just the way it works. It’s PROTEIN people. Good fats. Things that are essential to your well being, if you will. You are doing yourself a huge favor here. That’s what I’m trying to say. Add cashews to a high powered food processor and blend until smooth, about 6-8 minutes. Periodically scrape down the sides if needed. Once smooth and buttery, add in the coconut oil and chocolate, blending and scraping again until totally smooth. Add in salt and blend again, tasting to see if it needs more. Store in a sealed container, preferably in the fridge. I go by the rule though… if I am going to eat it within 3-4 days, I do not refrigerate! Super Easy Creamy Tomato and Chicken Baked Penne. 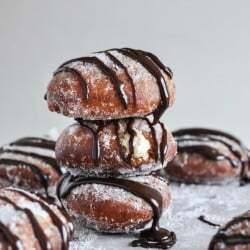 Peanut Butter Cream Filled Donuts. Looks delicious! I’ve never made cashew butter before, but have a big bag of raw cashews just waiting for this recipe. If you freeze cashews and blend them with milk and the other exact same ingredients (with the addition of a tablespoon of agave, if desired) you can have a super-rich and delicious “ice cream” to eat a bowl of. Cashew actually are one of my favorite nuts, along with pecans. I like to top bananas with nut butter for a healthy snack, yum. Gosh, that looks so addicting! This actually LOOKS like straight up frosting! I have to disagree with you on the cashew front (I could seriously eat them by the handful if I had just a smidgen less self control), but as long as we’re all on the same page about loving the sound of this chocolate cashew butter, we are totally cool. well I wanted to say I was going to try your fat snickerdoodles recipie today until I saw it had no cream of tarter. the name is always so strange to me, but I think it adds that tart flavor, why did you leave it out?? I don’t know why I don’t make more nut butters…in fact, I’ve never made them at all. I just don’t know if I have the patience to let my food processor work by itself for 6-8 minutes. I think it would drive me bonkers, and I’d be worried that my blade would break since instances like that happen to me on a daily basis. I also love the idea of giving little cute jars of the stuff to friends for gifts, but let’s be honest here…I don’t have the patience for that either. Clearly. I’m so glad you don’t litter your baked goods with nuts. They definitely have a time and place, but I’m not a fan of having them in cookies or brownies. This looks great. Cashews are my favorite! Milk Chocolate! So underrated! Sometimes the creamy sweet hug of milk chocolate is bloody perfect, especially when it’s cold out. Looks gorgeous. You can buy raw unsalted cashews at Trader Joe’s. Also they have unsalted cashews in bulk at Winco. Steal! I’ve never made my own nut butter before. Is it bad that I just don’t want to clean out the bowl of my food processor? This looks delish and so easy! Thanks for the idea. This will be great addition to my homemade Christmas goodie baskets! How lazy does it make me if i put a few cashews in my mouth with a handful of chocolate chips and chew real hard? I love homemade nut butters. Most recently I have been living on homemade peanut butter! This looks amazing! I will have to give it a shot as I have never tried cashew butter before! I’ve been meaning to make some kind of nut butter with my blender… cashew’s are my favorite nut! This would be amazing, I’m sure. What food processor do you have? Santa is bringing me a new one and I’m the most indecisive person ever! looks amazing Jessica. I love cashew nut butter, I make it at times. I heard it makes a great frosting, wonder how it would taste over a cupcake. I love the chocolate addition. I just bought the exact same bread. Does that mean I need some nut butter on it? I do this too. Sometimes I add in a little fresh jalapeño for a kick. SUCH FUN! I would venture to say you should be able to use any other oil as a replacement. I’m also a firm believer that nuts should never be in baked goods! This looks supper yum! That last picture, with it spread on the toast, really did me in. I want to grab a slice and (not so gracefully) shove it in my mouth. I’m a huge fan of homemade nut butters, and this one doesn’t look any less delicious than any of your others! Yummy. What no love for Baklava, Nut Rolls, Mexican Wedding Cookies, and rugelach. Anyway love your ceramic spoon where did you get it. And cashews are my favorite nut so this is on my make soon list. Jessica, you’ve done it again and what an easy and delicious holiday gift! Now i need to go out and buy not only a new mini-prep since I just killed mine making this (it was worth it!) but also some fun little mason jars to package up for holiday gifts! Thanks you and the varieties seem endless! What a great holiday treat!! And I love how simple this sounds!! Thank you for sharing!! I love the simplicity of nut butters. And you’re totally like me in the way that when I don’t want to cook, I try to think of what I can create in my blender or food processor. And dang, that’s a brilliant idea to give this as a gift! I think I’m going to do that for a lucky few. Thank you for yet another wonderful idea! I was just telling my hubby that cashews are my least favorite nut because they have a weird aftertaste and they’re kind of soft. Not exactly how I think nuts should be. But I think adding chocolate and processing it would solve all those problems. I love my food processor and although I haven’t licked the blade yet, I always think I can stick my good spatulas in there with the blade and somehow avoid slicing them up. Sigh. I’m too lazy to pull out the hard spatula that came with it. Maybe I should tape it to my processor so I have no more excuses. You convinced me I need a food processor for Christmas. I have wanted one for years but still don’t have one. Now? I definitely need one!! My sig. other and I have been together for over ten years,and he still doesn’t understand my relationship with nuts. I try to explain that I like nuts except in my baked goods, but apparently that is complicated and confusing… so I totally get it! OH YES! I need to start making my own nut butter (my husband is laughing right now; he’s 5, just FYI). I am way too obsessed with Justin’s, but with the price I need to make it in my own kitchen. I would eat toast every single meal till I used it all up!! Jessica, this is amazing. AMAZING. Where in the world do you get these nut-butter recipes?! Your photography is beautiful! I especially love all your NUT BUTTERS! can i use also something others than coconut oil? 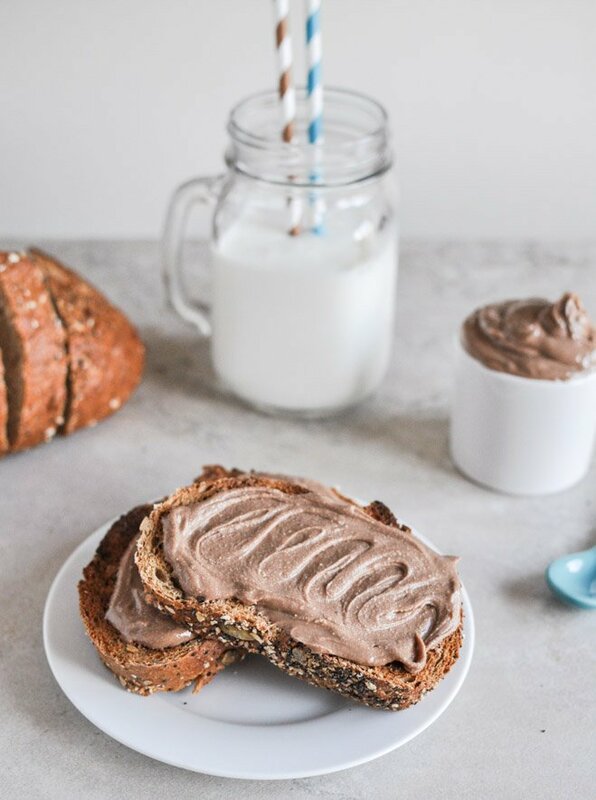 Pingback: Milk Chocolate Cashew Butter - Work It!